Since the beginning we've had ambitious goals for the quality of Pokemon TCG content we want to bring to you and are so grateful for all the positive support you guys in the community have given us after all this time. However, creating this content frequently at the quality bar we are striving for and that you deserve is requiring an increasing amount of resources. By joining our exclusive Candy Crew community by making a monthly pledge here on Patreon we think we have found a mutually beneficial way to make this a reality! What is my pledge going towards? Equipment - There's no shortage of ways to improve production values, whether its better camera equipment, green screens & props, audio equipment, video editing programs, etc. Travel Expenses - As competitive players we travel frequently and it can be very financially taxing to travel to major tournaments. Being able to make it to these tournaments allows us to provide coverage to let you guys know any breaking news or unexpected decks and/or cards that may pop up at the events. Product Openings - These are easily the most expensive videos we make and by joining our exclusive community we can ensure we always can pick up the most recent product release to show you pull rates and whatever else the newest Pokemon TCG releases entail. Giveaways & Contests - We do product giveaways from time to time on our channel, but we want to expand both the size of the product being given away but also the frequency at which we do these contests. Time - This is by far the most important thing your pledge goes towards. The ultimate goal is to go full time with the Pokemon TCG and Rare Candy. We want to scale back how much we work our day jobs and reinvest that time back into the channel and creating content for you guys. Just a huge thank you anyone who has ever watched one of our videos, picked up something from our online store, become one of our loyal patrons, or interacted with our brand in any way. 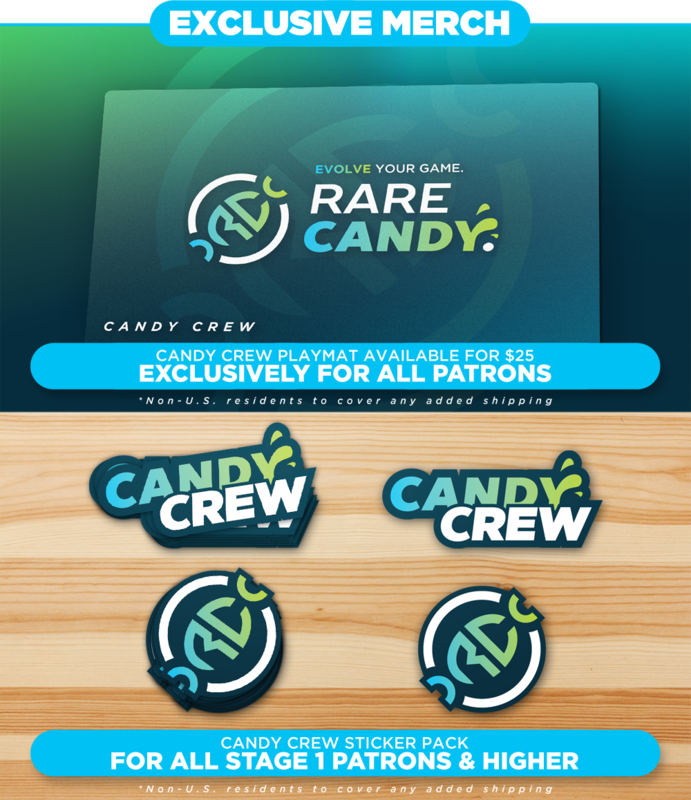 We're so grateful to have had the success we've accumulated so far, and we hope to see you join the #CandyCrew here on Patreon and help Rare Candy evolve even further! Your name will be listed in a special thank you section each of our videos. Work with us to choose video topics to cover plus a visual & verbal shoutout in the video. * Patrons are responsible for reaching out for deck advice. Video topics will be submitted in the comments section of a monthly submission post. Streaming is something we want to do more of in the future, and when we do it we want to do it right by getting some high quality professional graphics and overlays to give our viewers the best experience.